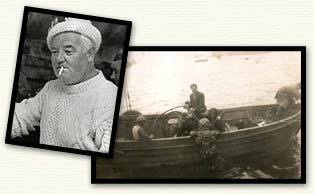 Jimmy O'Gorman arrived in Achill Island in 1939 to salvage the wreck of the Aghia Eirini. At that time Jimmy was the only Deep Sea Diver in Ireland. The 4330 ton steamer, Aghia Eirini, foundered on the western shore of Achill Island in 1939. The wreck lies in 15 meters on a rocky bottom. The cove is surrounded by high cliffs surmounted by a salvage derrick, which was used by a local man Mr J Sweeney, in the salvage operation. The diver was Jimmy O'Gorman.